We’re still at TowerPoint Resort in Mesa AZ. Enough going on to keep us interested. Zero bugs (scorpions aren’t bugs, right?) Low humidity and dewpoint mean we can, or not, use insulated cups for our drinks — the drinks can’t sweat regardless. It’s just too dry for condensing moisture. The low temperature a few nights ago was 40 here and 7 in Flagstaff, and our daytime temp made it to 70. What a great place for winter weather. We awoke to rain several mornings earlier this week, sort of rare for around here. Sure, we get a sprinkle now and then. But to have an entire morning of rain? There’s nowhere for it to go, the resort is probably 75 percent pavement and has no retention pond other than the tennis courts area. So a river runs down our street and down into the tennis courts. Unfortunately the rain didn’t let up before the courts filled up on the second day of rain. We ended up with between one and two inches of rain in Mesa in under two days. Rain doesn’t interfere with much for us. My tennis team match was rained out two weeks ago and later the same day other teams were able to practice on the same courts. We rescheduled for four days later, played the match, no problems. And missed a practice this week but had clear weather for our Thursday match. Sometimes we think we’re pretty busy before we step back and look at what’s really going on. We read the paper Sunday and after church Debbie hit the tennis courts for almost three hours of doubles. I pedaled across the street to another resort to visit with friends and help Jim KB0U get to know his Yaesu ham radio better. Upon my return we had a visitor, Melissa, who stopped because she saw the NOMADS door signs on our truck. Melissa also is a full-timer and volunteers with NOMADS like we do but we hadn’t met before. We had a nice visit comparing some of our work projects and locations and hope to talk again. By now it was time for me to run to the courts and practice. I had reserved court time and the ball machine for an hour. While I waited for Darren and Jan to finish their time with the ball machine I practiced serving balls on another court. Then I spent a wonderful hour hitting almost 1,000 balls, cross-court, cross-court, cross-court, cross-court, DOWN THE LINE! Rinse and repeat. . .
Backhand ten times, forehand ten times, backhand ten times, forehand ten times. Sounds repetitious, right? Finally I changed it, hit nothing but volleys for the last basketful of balls. The machine only tattooed me once, it shot a ball right at me at the net and somehow the ball avoided all my strings and the racquet frame. I usually don’t get hit by balls — gosh, it hurt! The practice is paying off. I read somewhere, in whatever we want to learn and do well, we should work very intentionally and “over learn”. Over-learning is to practice something over and over again until it becomes almost automatic. When you need the skill you confidently let it rip, says the teacher. Last year I lacked confidence in my topspin hits. My confidence is up and now the ball sometimes even goes where it’s supposed to. Oh yeah, I was talking about how busy we might or might not be? Sunday was pretty typical for us, visiting with friends and playing tennis and Debbie and me spending time with each other. Six days every week we can watch tennis matches in our resort’s tennis complex and we could play every day but try to give our arms and shoulders a break from the action. Almost every week there’s some sort of street party or potluck in the resort. We spent last Thursday afternoon at the resort-sponsored party with free burgers and beverages and dance music. We line-danced, had fun with a lot of swing music, had a few slow dances. Not a lot of people were on the dance floor but we don’t care, we have fun. Saturdays we often go hiking with tennis friends. Phoenix has great hiking in the hills all around. We’ve hiked in state and county parks on three or four Saturdays and are so fortunate to have Bill (my tennis partner) willing to lead the hikes. He knows his way around and always provides a nice five or six mile hike for the small group. Sitting here writing I forgot all about my nine o’clock ham radio network. Rats! I have another one at ten and another one at three every afternoon, if I can just remember. Bob w7iry and I have been playing around with the club’s FLEX 3000, a really neat software-defined ham radio. It’s a challenge running ham radio without visible antennas, but we don’t want to create problems for the resort or our neighbors so we try to not call attention to ourselves. Some mornings, according to my neighbors on one side, they’ve heard talking on their stereo radio speakers. Which is kind of odd — they say the stereo radio wasn’t turned on. I guess I’ll invite them to keep a brief log of when it happens, date and time, and I’ll compare it to my ham radio log. D’ya think the logs will match? We’ll see and experiment from there to solve it. The resort has a sewing and quilting room, a lapidary room, a woodworking shop, a nice library, ping-pong tables, billiard tables, dance lessons, and classes in conversational Spanish. We’ve attended the Spanish classes twice weekly for six weeks and are coming along okay so far. Leslie is a great profesora, trying to drag our wild bunch of seniors along into a fun new language. We haven’t spent much time at the pool so far. The swimming pools are gorgeous and the chaise lounges are comfortable, nice music piped in for the pool decks, lots of nice people to talk with. 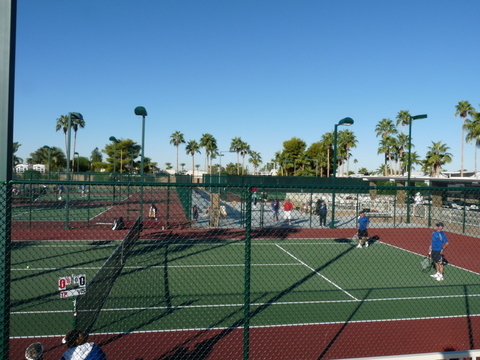 When the weather is best, really nice sunny days, we like to be at the tennis courts. I guess the conflict of interest between the tennis courts and swimming pools sort of sums up our “time situation” pretty well. We aren’t so busy as just doing a lot of what we want to almost every day. The weather is generally outstanding. And there’s so much we can do. We can’t complain about being too busy — but it does seem like we don’t have time to do everything we’d like to. We hope this finds you all well and enjoying the run-up to the holidays. We’re sorry we haven’t written before now — we do think about you and want to write. I feel like we have been dropped into funland and almost can’t get enough every day. There are no good excuses on this end and we will try to be better about staying in touch. We’re so lucky we don’t have any more serious concerns than time management. Life is great and winter in Arizona is a blast. Delray Tennis Center rocks! Debbie and I attended quarter-final matches yesterday. The stadium is almost three blocks from our RV space, we’d hear it but the crowds have been too light to generate any noise outside the stadium. Sitting in the stadium watching high quality tennis was really cool. We sat on bleacher benches in the east side general admission area awhile then a volunteer graciously granted us tickets to the expensive seats at south end of the court. The new vantage point was cool — we were ten feet above the court surface immediately behind the deuce court. Serves looked like they were coming at us. Ground strokes’ flight paths were clearly evident, soaring up to six feet above the net then zooming down into mid-court. We had far better perspective on ball flight and enjoyed the match better. Or were we watching better players? It seemed like it. I’m an okay tennis player. I can place the ball with spin, I can play at the net (sort of), I have a couple of different serves. And I’m still learning the game, even 45 years after I started playing. But watching these guys play is a bit disheartening. They cover the court side to side and front to back rapidly and easily, and they hit the balls so incredibly well. I know, I know. They hit all the time and might not enjoy it as much as I do. Still, they make it look so easy not only to cream the ball but to place it with light touches too. On the other hand, their best placed drop shots usually didn’t work. They’re all too fast, and simply jet up there and hit the ball into play again. Forty-five years I’ve played tennis and I never had attended a professional tennis match. I remember watching NCAA women’s tennis at Ocean Creek Resort in Myrtle Beach thirty years ago. Finally I’m married to a tennis player — she likes to hit with me and watch matches with me. Smart move on my part — no, not smart, just lucky. We’re parked really close, essentially adjacent, to the tennis club at TowerPoint. All to the good, this location is for us. We can readily see who’s out there, what courts are available, are the two ball machines in use already? Cal-Am, the resort management, sprung for a big season opener party with beverages and burgers. Celebrated the largely refurbished tennis facilities and return of the many tennis players. Trained so hard the first couple of days hitting with the ball machine on the tennis courts my hand was sore, my legs were sore, my shoulders were sore, my feet were sore. Going to have to pick up the conditioning as we go — season started last Monday. A couple of hours every day is working, and a new pair of sneaks to put more bounce in my jumps. 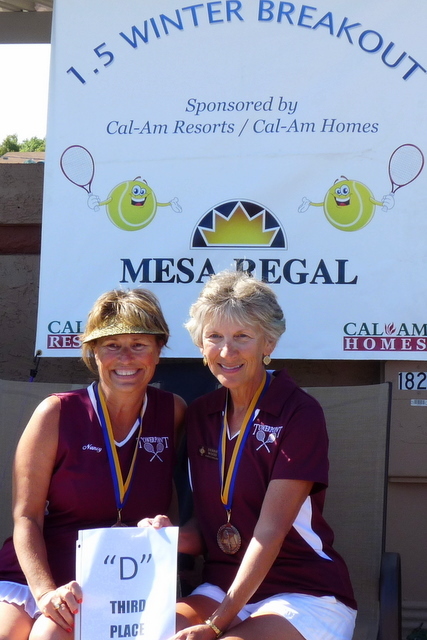 Debbie and I’ve each competed in two East Valley Seniors Tennis League (EVSTL) matches these past two weeks. My partner won one and lost one. 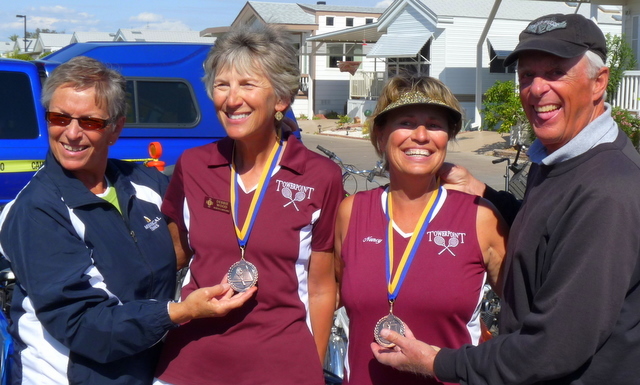 Debbie and her partner placed second both times in their matches, but they’re starting to win games. The season is young, a lot of players haven’t arrived yet. Still there are plenty of players already here and we can get as much hitting as we can stand. I’m playing in another league, too, and its matches are Wednesday afternoons. The Wednesday matches give me a chance to tune up for my Thursday morning matches. 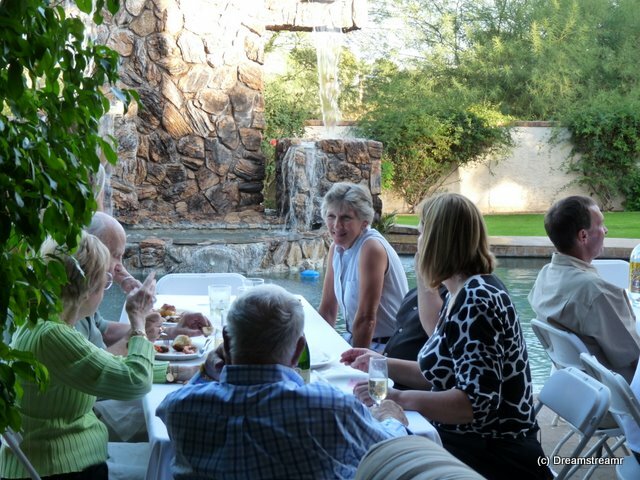 Last night we had our tennis club’s first monthly dinner. The dinner was well attended, maybe 200 people. It was an opportunity to recognize Darren and Jan for their work all summer, helping with various needs in the resort. We thanked DJ for guiding the resort’s addition of our fifth tennis court and many amenities for the Tennis Club. And we recognized new members, some of who just arrived and already expressed interest in the Club. Ten or more consecutive days of two hours daily tennis was enough, we decided to take a few days off last weekend. This has felt like a crash fitness course for us. We both needed the weekend for recovery time and to catch up on a few other things including blogs. I sketched outlines for four blog posts so should be able to post at least once weekly from now on. Yesterday evening, after tennis, I went through our box of friends’ business cards. It took a couple of hours but if you gave me your contact card then you are in our address book. Just one more way to organize the lot of things in our little space. We promise not to sell your card! But we can look you up more easily. Yeah, we’ve been on vacation for weeks — can’t you tell? Upon arriving at Towerpoint Resort in Mesa, AZ, our life suddenly took a busy turn. So busy, in fact, we quickly resorted to Google Calendar to organize and track our plans. We still get Sundays off after church service, although it’s fun to play ping-pong Sunday evenings at the resort pavilion. The other eight days a week we are playing tennis, hiking, walking, touring the area — almost anything except sitting around. We’re sightseeing more than we anticipated in our short visit to this area. We thought a month would pass so quickly we would just get a little orientation to Mesa and not really spread our wings at all. Close to true but we’ve done more than we expected. First, we extended our stay from four weeks to six weeks. Second, Jim’s brother, Chuck, flew in from North Carolina and invited us to join him and our nephew, Tom, for our first visit to Taliesen. I’ll talk more about this in a minute. Same day we joined Chuck and Tom for a visit to In-N-Out Burger, a sort of southwest hamburger chain with maybe two hundred locations. We are proud of them, they only do hamburgers, cheeseburgers, fries, pop, and shakes. No extended menus here — way to go! A big however, however, we were disappointed they don’t even talk chili (did you ask for chili peppers, ma’am?) and slaw (slaw? what?). Okay, we’re still from back east or, as they say around here, “out east”. We next toured downtown old Scottsdale. Old is a funny term for something invented in the 1950’s, don’t you think? I know, I know, Scottsdale was supposedly founded by Hohokam as early as 800 AD. 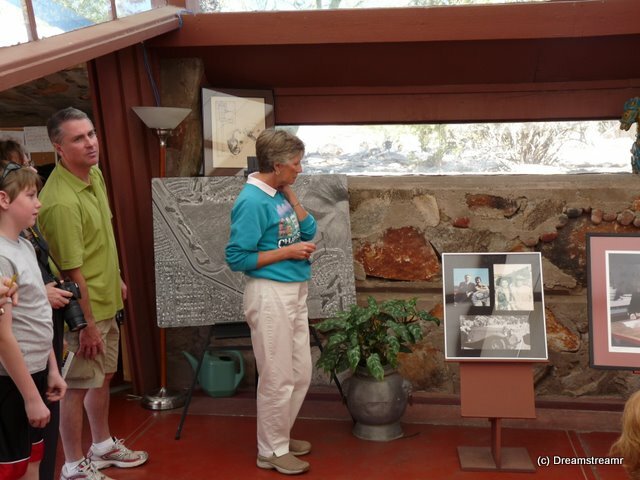 They left around 600 years later, and Frank Lloyd Wright next showed up in the nearby McDowell Mountains almost 530 years later. And still Scottsdale was almost nothing before the 1950s. One “early” institution of Scottsdale is The Sugar Bowl. We had scarcely exhausted our burgers and fries but had to treat ourselves to a visit to The Sugar Bowl. If you’re like us you’ve been introduced to The Sugar Bowl in Scottsdale without realizing it. Bil Keane somewhat regularly includes it in his comic strip, Family Circus. We enjoyed sundaes and a great cup of coffee before striking out again for our walking tour of “old Scottsdale”. But we could have spent this time writing on our blog, eh? 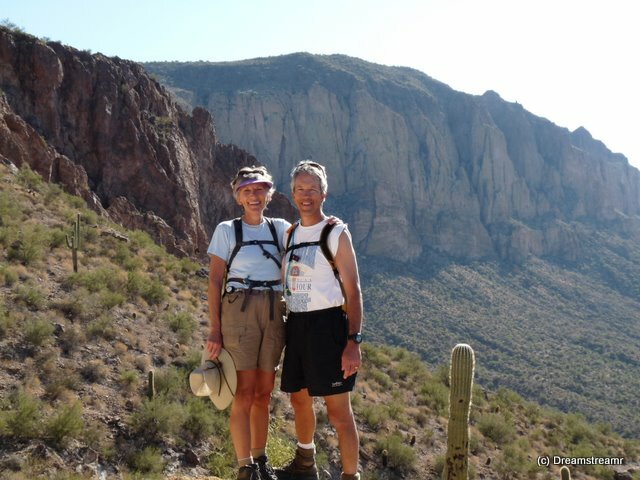 We’ve had two great hikes in the Superstition Mountains area with another planned for this weekend. Towerpoint Resort has several hiking clubs and it’s easy to hook up with a group for one day or another of hikes. We appreciate Bill and Diana leading the hikes on Saturdays, we wouldn’t know where to go without them. The hikes have been approximately seven miles at a fairly easy pace, and the weather has been fabulous. Our visit to Taliesen was so nice we decided to go again a few days ago. We took a longer tour, for three hours, for more details on the campus, the architectural school, and the history. This was fabulous for us. Some of the information was a repeat of our “Insights” 90 minute tour. The “Behind The Scenes” tour was better all around. We like our tour leader’s presentation better. She seemed to understand her information and deliver it better. And we enjoyed sitting in the Taliesen dining room for tea and pastries as we listened to a Taliesen Senior Fellow, Polly, describe life and work under Frank Lloyd Wright’s direction. When we’re sitting around, not reading, we’re playing home designer. Our second visit to Frank Lloyd Wright’s Taliesen West included a fun and lengthy visit to the bookstore. We pored for two hours over the large array of books and awarded ourselves an early Christmas present of the Frank Lloyd Wright Companion in cd format. This is perfect for us in several ways. The book is a collection of a huge number of FLLW’s works. His works are described in text, portrayed in pictures, and defined in graphic floorplan. We sit for hours sifting through many of his house plans. We’re enjoying pretending we’re designing our home, and enjoying the amazing possibilities for a 1,000 SF home. But we could have spent this time writing on our blog, eh? 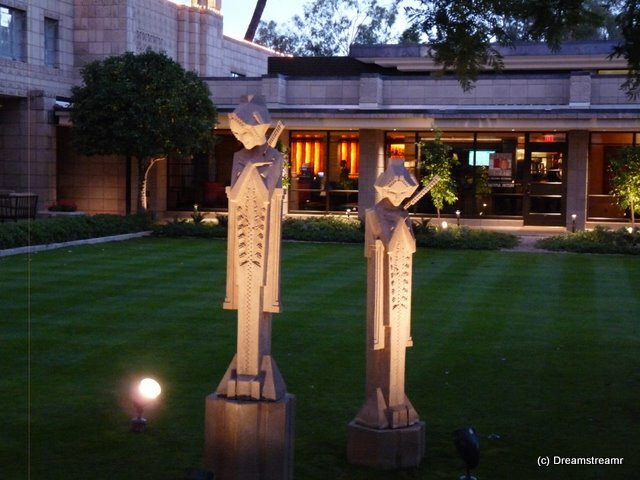 Who knew George Vanderbilt had a hotel in Arizona? Actually he didn’t, but it is named the Biltmore nonetheless. We had a nice time visiting one evening on our own. Pretty nice place, even if you aren’t spending any money. Frank Lloyd Wright was the consulting architect on this project, and his influence shines through delightfully. It was fun to learn of his use of Sprites in some projects, and we enjoyed a relaxing evening walking the grounds and the lobbies. 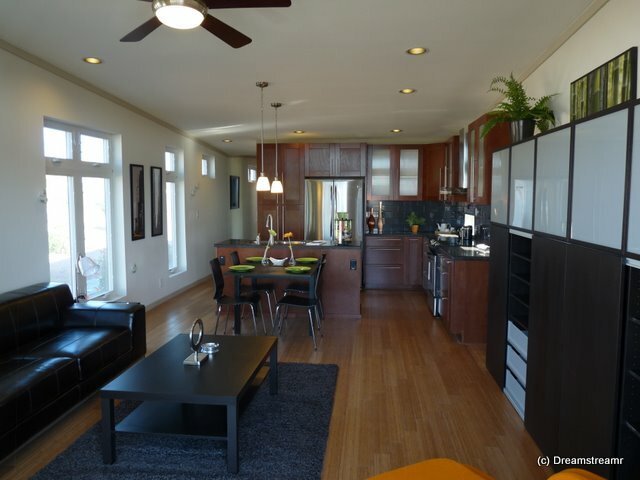 Clayton Homes has recently added an iHouse model in Mesa, AZ. You may remember we wrote two months ago about our first visit to an iHouse, in Everett, Washington. We could have described it as “the house we’re looking for, if we’re looking for one.” But we’re not ready to buy a house since we don’t know where to put it. 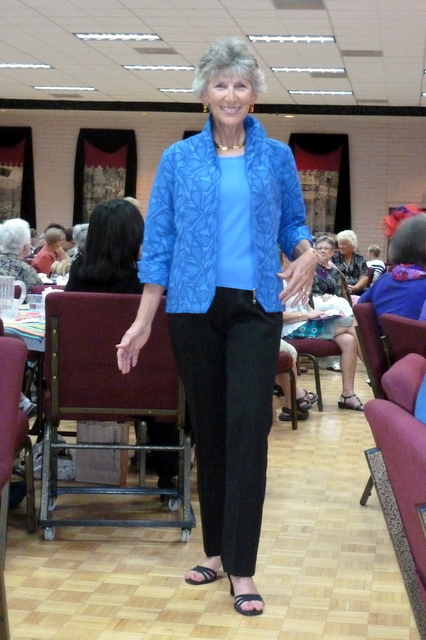 Shopping is all the fun anyway, and we had a lot of fun visiting the iHouse in Mesa a few weeks ago and again yesterday. What else have we been up to? We had a great Thanksgiving with Jim’s brother’s brother-in-law. David put on a huge spread for family and friends and we are fortunate we could celebrate Thanksgiving with them. We left David’s to drive back to our home and couldn’t find a single game on television. You already know this but we didn’t realize Monday night football (and Thanksgiving football too, it seemed) aren’t on network broadcast television any longer. Is this correct? And if it is, why is it right? Okay, I’m done ranting. Finally, we’re catching up on our periodicals, a little, in between visits to the tennis courts. You can never really get ahead of them. Hundreds of people are at work all day and night, somewhere, putting together and publishing magazines full of junk. We pay to have almost a dozen magazines sent to us every month. Read one every two days and we’re staying even. But it takes us each a day or two, at least, to get through them because we don’t read magazines for more than a couple of hours a day. Every week we read the entire Sunday newspaper after church and don’t even get to a magazine. And we were behind to start with — so we’re packing a couple dozen magazines at all times around here. As Barry pointed out in a comment yesterday, we’ve obviously not been putting the needed time into writing. And not because there is a dearth of material here. We could write two times a day, there’s so much to tell. We could write about the variety of Christmas decorations going up on the little park models (mobile homes) throughout the Resort. We can write about the sharp increase in population in the resort as December starts. Or we could write about our resistance to the holiday music starting already at the Resort’s pavilion since Thanksgiving. Better, we could write about the sweet sights and sounds of life in Paradise. The sun is setting and from our house we can see pink clouds and skies all around us, punctuated with fifty feet tall palm trees softly swaying in the breeze. We have an almost constant symphony of small aircraft softly humming their distinctive notes overhead enroute to or from Falcon Field nearby. Throughout every day we have the clearly sensible temperature rise, peak, and decline as the temperature follows closely the sun’s effect on our little neighborhood. No promises about any writing. Although we greatly enjoy writing and have a lot of fun reading your comments, we’ve hit a temporary new Mesa mode. We’re thoroughly sucked into the Resort’s tennis club and enjoying every minute of it. We’re enjoying fantastic (if very dry — can you spell dewpoint of 7 degrees F?) weather and new friends, and a very different place. We’re tasting some new foods, or perhaps just old foods much hotter than we’ve experienced before. And we’re making the most of this before we head back east for Christmas and then down to south Florida for Q1 2010. Sunny greetings from Mesa — We’re on Holiday, and will write when we return. Thanks for waiting patiently as we think about (and experience) what to write. Or, maybe we’re just on the tennis courts . . .
See you down the blog!